The Enlightened Equipment Revelation Quilt is one of our favorite sleeping bags/quilts for lightweight backpacking adventures. 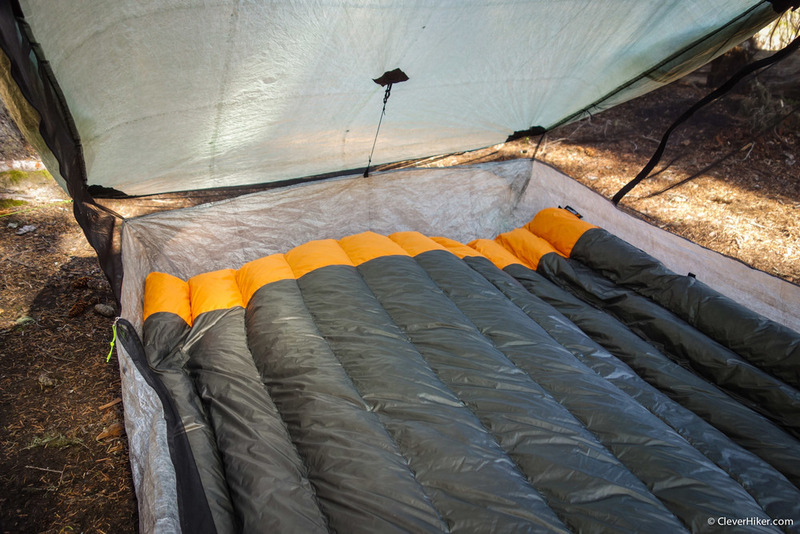 The flexible design of the Revelation has been a game changer for our backcountry trips, and we love it's warmth-to-weight ratio. Quilts like the Revelation do tend to be a bit more drafty than sleeping bags, so they're not a great fit when temps dip below freezing. But if you mostly backpack in warm weather during the spring, summer, and fall, you're likely to love the freedom of the Revelation. The biggest differentiator with the Revelation is its clever design. When completely un-cinched it lays flat just like the comforter on your bed at home. 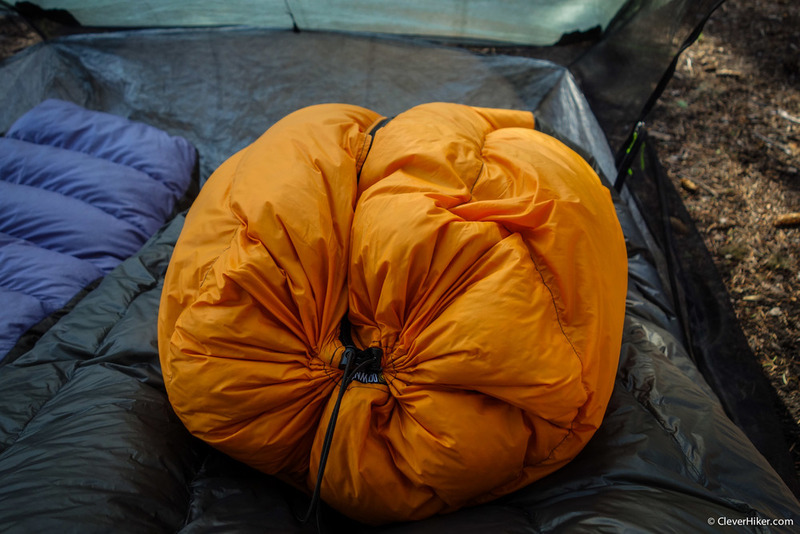 If you want to increase warmth, the bottom of the bag cinches tight to create a fully enclosed footbox, similar to a sleeping bag. This design creates an excellent blend between weight, warmth, and functionality for backcountry trips. In addition, the Revelation comes with two elastic sleeping pad clips, so you can fix the quilt directly to your pad. This will help keep the quilt on top of you, even if you do a lot of tossing and turning throughout the night. We find pad attachment straps like these to be helpful, especially on frigid nights, but they're also annoying to deal with, so we rarely find ourselves using them. If you’re new to quilts you might be wondering if this type of design will keep you warm in the wilderness. If you choose a warm enough model and size it properly, quilts are great at retaining heat and they save a lot of weight too. In general, we prefer quilts when temps are going to be around freezing (32°F) or above. If temps get colder than that, we prefer sleeping bags because drafts are easier to prevent with a fully enclosed system. 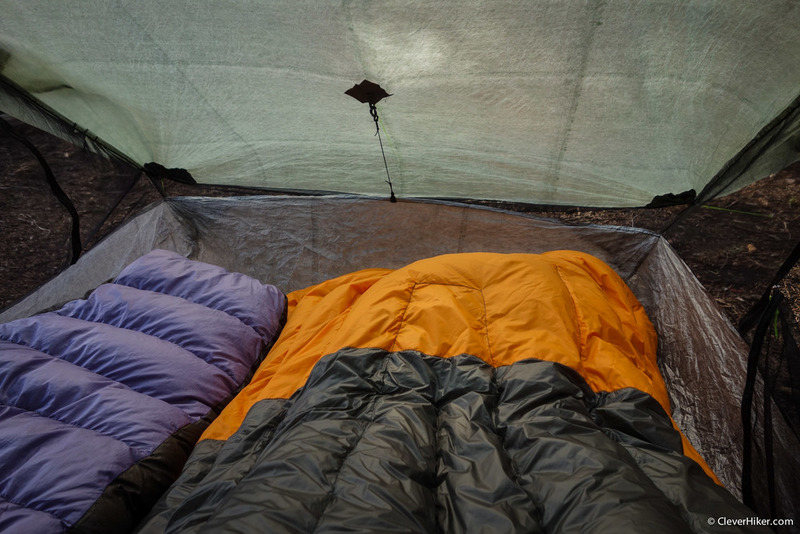 PRICE - This quilt is competitively priced, especially in the ultralight sleeping bag market. The 850 fill 20°F, 10°F, and 0°F models deliver excellent value in our opinion. Please check the Enlightened Equipment Revelation page for specific price details. 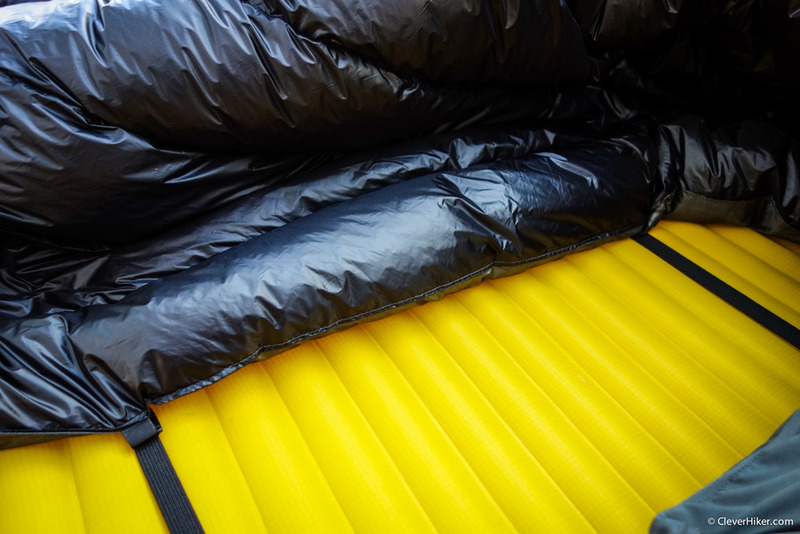 WEIGHT - 20, 23, and 26 ounces are the respective weights of the 20°F, 10°F, and 0°F Revelation quilts, all of which are very light. Keeping weight down is key benefit for any backpacking trip, and this is one of the main strengths of the Revelation. DEGREE RANGE - The Revelation is available in 50°F, 40°F, 30°F, 20°F, 10°F, and 0°F temperature ranges. Just remember, these are not official EN ratings and almost all sleeping bag manufacturers heavily exaggerate warmth. So a 20°F quilt will keep you alive down to 20°F, but it certainly won't keep you warm. We recommend adding 20-30 degrees to the Revelation's rating for a more realistic comfort estimate. So for men, we like the 10°F Revelation model for trips to right around freezing (32°F). For women, we'd recommend the 0°F model for the same conditions, because women tend to sleep colder than men. The same logic applies for the 20°F and 30°F quilt models, which are a good fit for nighttime temps in the 40s, 50s, and 60s in our opinion. 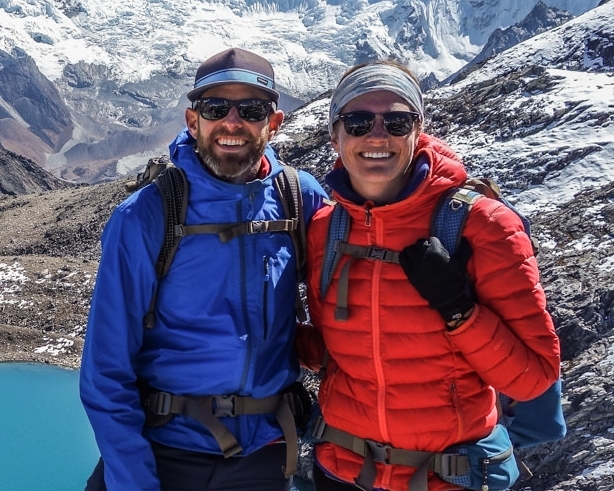 We like to hike in the mountains, where nighttime temps tend to dip, even in the summer, so our top recommendation is the 10°F model for men and 0°F model for women. DOWN FILL - The base Revelation comes with 850fp down, which provides a good balance of warmth and affordability. The down comes with DownTek water resistant treatment, which will help your bag dry faster and resist moisture more effectively. You can also select 950fp down if you're willing to pay extra for more loft and less weight. LENGTH - There are five lengths to choose from with the Revelation, depending on your height. If you're on the edge, we recommend bumping up one size for the option to fully cover your head on chilly nights. Dave is 6’2” and he uses the "long" size, which is an excellent fit. WIDTH - Four widths are available from slim to extra wide. We recommend bumping up one size in width for more coverage on chilly nights. This can be especially helpful if you're wearing extra clothing or a bulky puffy coat. Dave is an average build, but uses the "wide" size and finds that it works well. FABRIC - Several choices of 7d, 10d and slightly thicker 20d nylon fabric colors are available. The lighter 7d and 10d fabrics will shave off a couple ounces from the total weight. You can also choose 20d nylon stripes for the head and foot of your quilt to add water resistance where you need it most. We chose to add the nylon head and foot stripes on one of our quilts mostly because we like the look, but the functionality is nice too. SHIPPING TIME - Enlightened Equipment builds their custom quilts when ordered, so you'll have to wait for them to make it and ship it. This usually adds at least a couple weeks (currently 3-5 weeks), but can be worth it for a high-quality custom piece of gear. 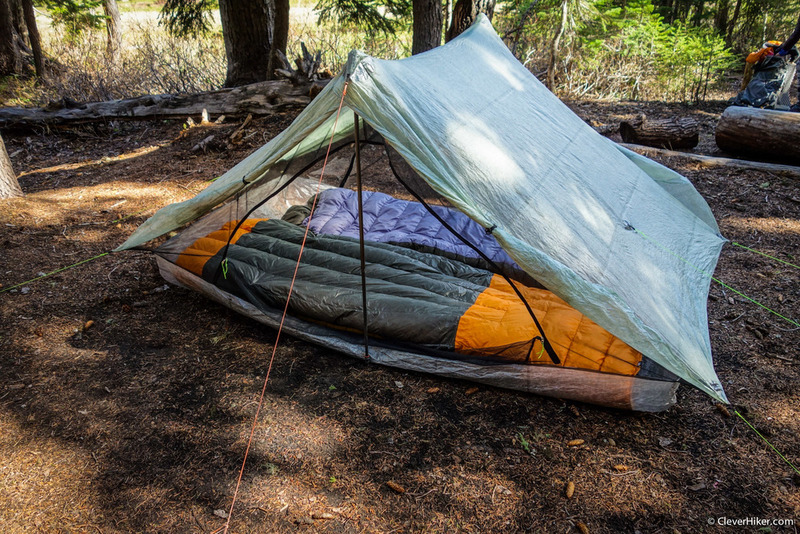 We highly recommend checking out the Revelation Quilt if you’re in the market for an ultralight, 3-season sleeping bag or quilt. We don't take the Revelation on the trail when temps are going to be below freezing, but for most other conditions we think it's an excellent fit. 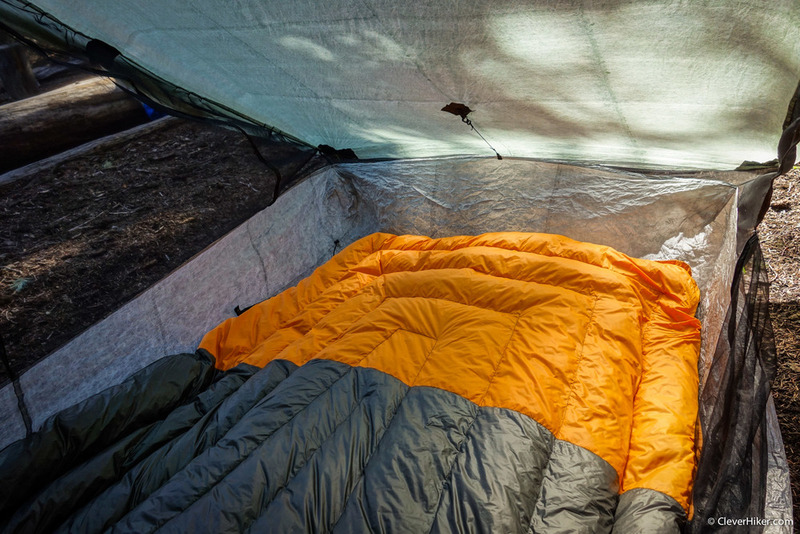 The Revelation has become one of our all-time favorite sleeping bags, and it's often in our packs when we're on the trail, so we think it has a lot to offer. Just remember, the temperature ratings of this quilt (and sadly most others) are heavily exaggerated. So our top recommendation is the 10°F model for men and 0°F model for women if you plan to encounter nighttime temps around freezing (32°F). We also recommend bumping up one size in length and width to make sure you have full coverage on chilly nights. If you enjoyed this review, you'll probably like the CleverHiker Gear Guide as well. Here are some popular resources to check out.